Grapette is the newest addition to KatersAcres. Grapette is a larger dragon who appears in the fall season. She loves to hide underneath the grape vines. Parker found her while he was whistling through the orchard. Something reached out from under the grapevine and touched his foot. There was Grapette smiling up at Parker. They’ve been best friends ever since. Each year Kater’s Acres releases a signature Parkers. This little Parker is celebrating the autumn season with a cute little pumpkin. Hand-blended Custom Color Premo! Polymer Clay, Blending Chalks, Acrylic Paint, Black Wire. Please remember that Parker & Lolly are copyright KatersAcres®, 2010 & 2013 respectively. Do not copy their likeness. Are you looking to challenge & stretch yourself, increase your skills, & be productive in 2015? Come on & join us. 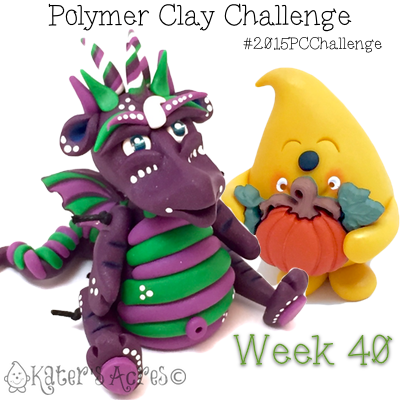 Take part in this worldwide, global initiative to make 2015 the BEST year for polymer clay ever! CLICK HERE to find out more information & learn how to join.